Professor Nelson is currently at work on his second monograph about the interconnections of North American and German colonial practices through the journeys and policies of the Agrarian Economist Max Sering (1857-1939). For articles on this topic see below and information about the documentary on this project see 130yearroadtrip.com and the video section. 2011, German Soldier Newspapers of the First World War (Cambridge University Press). 2014 | ‘A German on the Prairies: Max Sering and Settler Colonialism in Canada’, Settler Colonial Studies (forthcoming, available online). 2014 | ‘“Inner Colonization” and Race: Germany, Canada, and Globally Transferrable Concepts from the 1880s to the 1940s’, in Wissen - Transfer - Differenz. Transnationale und unterdiskursive Verflechtungen von Rassismus ab 1700, edited by Claudia Bruns and Michaela Hampf (Wallenstein, forthcoming). 2014 | ‘German soldier newspapers and their Allied counterparts’, in Reading and the First World War, edited by Shafquat Towheed (Palgrave, forthcoming). 2014 | ‘Utopias of Open Space: Forced Population Transfer Fantasies during the First World War’, in Legacies of Violence: Eastern Europe's First World War, edited by Jochen Böhler, Wlodzimierz Borodziej, and Joachim von Puttkamer (de Gruyter), pp. 113-128. 2012 | ‘The Allied Bombing of German Cities during the Second World War from a Canadian Perspective’, Journal of the History of International Law 14: 87-122. 2012 | with Veronika Mogyorody, et al., ‘Integrating peer mentors into first-year course design’, in Engaging the 21st Century Student through Peer-led Learning, edited by Tania Smith (Peter Lang), pp. 67-91. 2011 | ‘The Baltics as Colonial Playground: Germany in the East, 1914-1918’, Journal of Baltic Studies 42: 9-19. 2010 | ‘From Manitoba to the Memel: Max Sering, Inner Colonization and the German East’, Social History 35: 439-57. 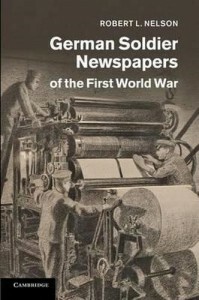 2010 | ‘Soldier Newspapers: A Useful Source in the Social and Cultural History of the First World War and Beyond’, War in History 17: 167-191. 2009 | “Introduction: Colonialism in Europe? The Case Against Salt Water”, in Germans, Poland, and Colonial Expansion to the East: 1850s through the Present, edited by Robert L. Nelson (Palgrave), pp. 1-9. 2009 | “The Archive for Inner Colonization, the German East, and World War I”, in Germans, Poland, and Colonial Expansion to the East: 1850s through the Present, edited by Robert L. Nelson (Palgrave), pp. 65-93. 2002 | ‘“Unsere Frage ist der Osten”: Representations of the Occupied East in German Soldier Newspapers, 1914-1918,’ Zeitschrift für Ostmitteleuropaforschung 51: 500-528. 2002 | “German Comrades — Slavic Whores: Gender Images in the German Soldier Newspapers of the First World War” in Home/Front: The Military, War and Gender in Twentieth-Century Germany, edited by Karen Hagemann and Stefanie Schueler-Springorum (Berg), pp. 69-85. This article appears in German as “Deutsche Kameraden — slawische Huren. Geschlechterbilder in deutschen Feldzeitungen des Ersten Weltkrieges” in Heimat — Front. Militär und Geschlechterverhältnisse im Zeitalter der Weltkriege, edited by K. Hagemann and S. Schueler-Springorum (Campus), pp. 91-107. 2014 | ‘Soldier Newspapers’, 1914-1918-online. 2011 | ‘Emptiness in the Colonial Gaze: Labor, Property and Nature’, International Labor and Working Class History Journal 79: 161-74. 2009 | “Germans at War”, International History Review 31: 85-95. 2004 | ‘“Ordinary Men” in the First World War? German Soldiers as Victims and Participants’, Journal of Contemporary History 39: 425-36. 2004 | “Soldatenzeitungen”, in Encyklopedie Erster Weltkrieg, edited by Gerhard Hirschfeld, Gerd Krumreich, and Irina Renz (Schöningh), pp. 849-50. 2000-2014 | 24 Book Reviews in journals such as: Journal of Modern History, Central European History, German History, Zeitschrift für Ostmitteleuropa-Forschung, Nationalities Papers, International History Review, Journal of World History, Slavic Review, Canadian Journal of History, Journal of Military History, Journal of Contemporary History.